Fitness Belt for iPhone 7, iPhone 7 Plus & Other Smartphones is rated 3.8 out of 5 by 4. Rated 1 out of 5 by Diabetes4L from Orange stains are not ok I use this belt to hold my insulin pump for diabetes. It has stained my pump cover that I received for Christmas that was red and white to look like a Pokémon ball, to now red and orange. Also it stains the tubing that runs from my pump to my body orange. Not cool when you spend $40 on a belt meant for technology and it leaves stains all over your things. Rated 5 out of 5 by Steve333 from Perfect for Runners that don't like Armbands This pouch is perfect for runners that don't like armbands. It's very streamline not bulky and holds my Samsung S6 while in a smaller hard case. It's designed to stretch when on you so can adjust it to where it feels comfortable and prevents your phone from moving while your run. Love it and hope Belkin keeps selling it! 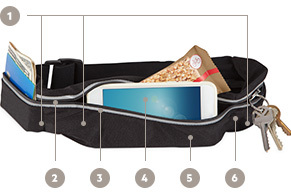 Rated 4 out of 5 by Pugdoc from Versatile and well designed I cycle in clothing that often does not have pockets so this is the perfect way to safely carry my phone and have quick and easy access. I probably will use it even when traveling for the phone, ID and keys. The description was a bit confusing about the size of what it can accommodate. It will easily hold up to a 6s plus phone and all smaller phones. You have to step into this or put it over your head to get it to your waist. Rated 5 out of 5 by Nikki from Love it! It holds so much, easy to put on and zippers allow me to listen to music with phone in it.